I don't deserve the goodness of God. I seem to make so many mistakes. In fact there are days when I get up and want to do only good things but end up making some poor choices instead. I fall short in so many ways. The Bible says that this is true of all of us so I know that I am not alone. I have others that are part of his family that are trying to live a life that honors God and navigate the trials and challenges too. But the news gets even better! I may make a mistake today but tomorrows mercy is not the same as today's. He has compassion on me each and every day and he knows my weaknesses. In fact, when I am my weakest, he becomes strength for me! Have you made some big mistakes? Don't dwell on what's done, look forward to what's coming! 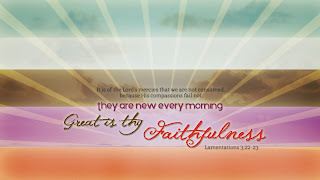 New mercies...God's compassion...GREAT is His faithfulness!